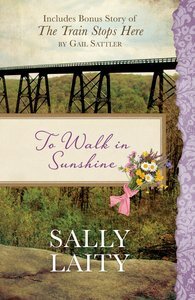 Readers will enjoy an inspiring historical romance set in 1920s Pennsylvania coal country from bestselling author Sally Laity. Ken and Rosalind develop a friendship that is forbidden by her Old World family. Also includes a bonus Great Depression era romance, The Train Stops Here by Gail Sattler. About "To Walk in Sunshine/The Train Stops Here"